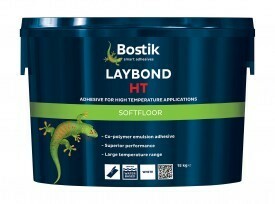 Bostik Laybond HT is specifically formulated to give high performance over a large temperature range, along with excellent plasticiser migration resistance. For areas of high solar gain, such as conservatories and in conjunction with underfloor heating systems. It is white in colour and has a trowellable consistency.